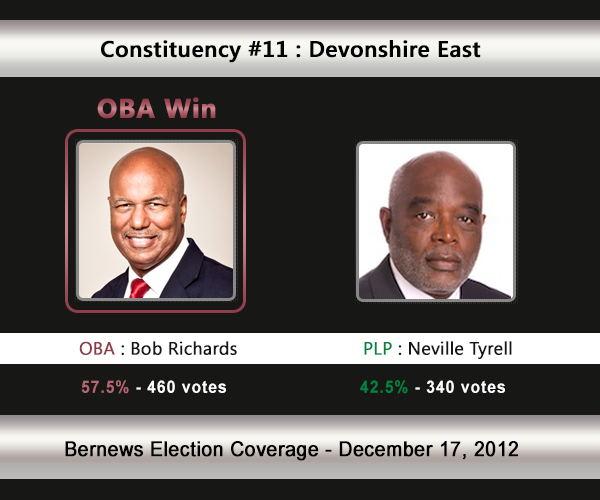 [UPDATE Dec 17: Election Results] Incumbent Bob Richards [OBA] has held off a challenge from Neville Tyrell [PLP] to retain his seat in C#11 Devonshire East. Devonshire East will see Shadow Minister of Finance Bob Richards [OBA] challenged by the PLP’s Neville Tyrell. These two gentlemen matched up in 2007, with Mr Richards [under the UBP] winning 51.74% of the vote against Mr Tyrell [402-375]. In the 2003 General Election, Michael Dunkley [UBP] won with 63.68% of the vote against Mr Tyrell who received 36.32%. 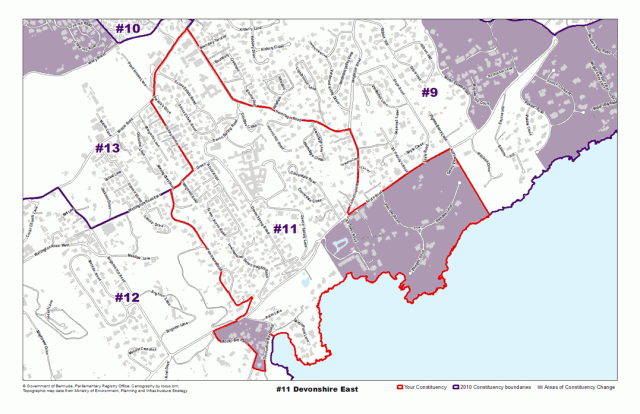 Areas the Devonshire East constituency compromise of, or is located by, includes Watlington Road East, Chaingate Hill, Middle Road, Hermitage Road, Verdmont Road, Collectors Hill, South Road, Devonshire Bay Road, Poinciana Road and more. Neville Tyrrell has had a long and successful career in management in the private sector. His commitment to his country is reflected in the wide range of his community activities as well as his years of dedicated service to the Progressive Labour Party (PLP). He was educated at the Central School (now Victor Scott), the Bermuda Technical Institute and the Cranfield School of Management in the United Kingdom. He began his career with Cable & Wireless as a Trainee Telegraph and Coast Station Operator and left the company in 1996 where he had risen to the position of Manager, Human Resources and Administration. Since 1998, he has been employed with Colonial Pension Services Ltd. as a Pension Consultant. Previous community involvement includes serving on the Boards of: Race Relations Council, Sports Development Council, Education Planning Team, Bermuda Council for Drug Free Sports, Government Air Advisory Committee, CedarBridge Academy Board of Governors, Government Golf Courses Board of Trustees, Government’s Sports Hosting Committee, Member of the Chamber of Commerce ICD Scholarship Committee and The Broadcasting Commission. Mr. Tyrrell is presently a Member of the Government Public Transportation Advisory Committee and the Government GEHI Management Committee. He also recently Chaired the Government Taxi Authority Review Committee. He is a Past President of the Bermuda Football Association (from 1996 to 2001), having held various Executive Member positions on the BFA Council from 1971. He has been an Honorary Vice President since 2003. He has held positions of Treasurer, Vice President and Assistant Coach with Centaurs United Football Club, and a playing career with CUFC spanning 10 years. He is a Member of CONCACAF Competitions Committee and Match Commissioner during 1996-2001. Mr Tyrrell has been a Member of the Hamilton Rotary Club since 1984. He was Club Director in 1990, 2004, 2005 and 2006. He was elected a Rotary Paul Harris Fellow in 1991 and Club President in 2008. He is Past Master of Lodge Somers Isles and Past Director of Ceremonies. Presently he is Lodge Secretary; he is also a Past Secretary of the Bermuda Shriners Club. In the PLP he has served as Deputy Chairman of the Warwick Branch 1996-98; Co-Campaign Chairman for Warwick Branch during 1998 General Election; Secretary General from 1998; and Party Chairman November 2000 to March 2004. He was the PLP candidate in Devonshire East in the 2003 and 2007 General Elections. In the 2007 election, Mr. Tyrrell’s determination and resolve brought him within 27 votes of victory, a vast improvement from the 2003 election. He served as a Government Senator from March 2004 to October 2006. He is married to Sheila, with 3 children Teena, Craig, Nekisha. Bob Richards was born and raised in Bermuda attending Purvis School the Central School and the Berkeley Institute. His further education gained him a BA in economics from Waterloo Lutheran University in Ontario, Canada and a Bachelor of Commerce and MBA from the University of Windsor, Ontario Canada. After working with two Canadian banks in Toronto, he returned to Bermuda where he joined the Bermuda National Bank. In 1978 Bob joined the Bermuda Monetary Authority, where he worked as an economist and ultimately as General Manager in charge of research and investment of Bermuda’s official foreign exchange reserves. During this period he completed courses at the IMF Institute in Washington D.C. on international balance of payments methodology and at the Federal Reserve Bank of New York on international investments for central bankers. He was a delegate at the Annual General Meeting of the Bank for International Settlements in Basle, Switzerland. In 1983 Bob became Investment Manager for Shell Trust Bermuda Ltd. managing an international investment fund and developing a sophisticated computer tracking, analytical and order execution system. In 1987 he founded Bermuda Asset Management, Ltd. (BAM) as the first independent investment company in Bermuda. In 1995 BAM became affiliated with INVESCO. He was appointed General Manager of INVESCO Global Asset Management Ltd. and a Partner in Amvescap PLC., the ultimate parent of INVESCO. In 1999 INVESCO left Bermuda and BAM reverted to being a family business. In 1997 Bob was appointed to the Bermuda Senate where he served as Government Leader, and also as Minister of Telecomunications. He has also served on many other public sector boards including the Bermuda Hospitals Board, the Bermuda Monetary Authority, the Public Funds Investment Committee, the Bermuda Association of Securities Dealers, and the Economic Council. He was reappointed to the Senate in 2004. In 2007 Bob Richards was elected a Member of Parliament and since then has served as Shadow Minister of Finance. He currently is President of Bermuda Information Technology Services Ltd. He is also a Fellow of the Institute of Canadian Bankers and is married with two sons.